Como is a charming city. Its various claims to fame include its production of fine silk, its remarkable cathedral, its renowned opera house, its preserved historical centre and its important collection of modernist buildings. But, of course, what attracts most visitors is its location on the beautiful lake to which it gives its name. To stay in this charming city, you will need a charming hotel. And I have one for you, looking straight at the lake and within easy walking distance of all the sights. It is the Palace. 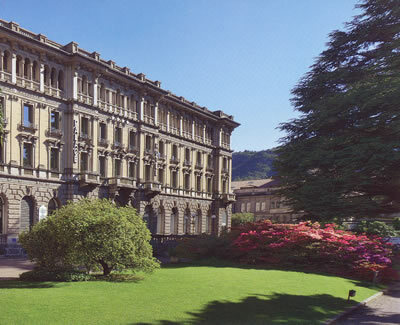 The hotel inhabits two buildings which form a right angle: the Palazzo Plinius, designed in the 19th Century by Federico Frigerio, and the more modern Pianella wing. We are here in the land of the four-star hostelry, so the Palace does not offer the opulence of the five-star deluxe establishments to which the readers of Bown’s Best will be accustomed. Nevertheless, this is a well-run and comfortable place in which to stay, and it has parking for your motor car (and parking is in very short supply in the city). I am therefore happy to bring it to your attention. My billet was a ‘Lake View Room’ (number 227 – check on the hotel website for the rates for specific dates). It did, indeed, offer a splendid panorama, framed with mountains. I would suggest, however, that you might want to go one or two categories higher (to a ‘Deluxe Room’ or a ‘Junior Suite’) and thereby secure a little more space. Still, my apartment was certainly spick and span. The hallway contained fitted wardrobes (with a private safe) and the door to the bathroom, wherein were white walls, black tiles, a decent bath tub with a shower over, one wash basin, a bidet and supplies of good-sized white towels. In the bedroom, the television was wall-mounted and one wall was decorated with reproductions of ancient advertisements for silks. One armchair, two upright chairs and a writing desk stood on the green carpet. I found the staff throughout the hotel courteous and friendly. The General Manager, Robert Anthony Webber – pictured, with your correspondent – was brought up in Leeds, and we know that the people of Yorkshire are famous for their hospitality. 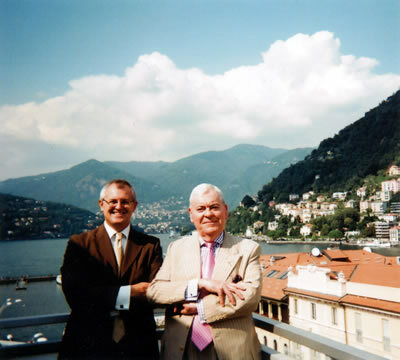 He also manages the nearby Hotel Barchetta Excelsior, to which I walked for dinner one evening (see below). The wine list has just 84 offerings, but they are well chosen and keenly priced. All are Italian, except the champagnes. Prices run from 18€ for an Umbrian white to 91€ for a 2010 Barolo. I noticed a fine trio for your bubbly, white and red super-Tuscan: 2011 Franciacorta, Bellavista brut (61€), 2011 Cervaro della Sala, Antinori (54€) and 2012 Tignanello (77€). For my own red I had the 2012 Le Serre Nuove (55€). Made by Ornellaia, this was a lovely, intense, chocolatey, hot wine, full of the flavour of ripe damsons. I breakfasted in the hotel’s Magna Hall, a pretty room in the Classical style, which was decked out with gilt-framed mirrors, crystal chandeliers and paintings of naked ladies. These last seemed to be enjoying the fresh air in the Italian countryside. I am sure they would also have enjoyed, as I did, the melon, pineapple, bacon, cheese and crusty bread from the buffet. An excellent fellow was in charge of these arrangements, but I neglected to ask his name. (Later I discovered it was Christian Melis, 2nd maitre d'.) He even arranged for the kitchen to make some orange marmalade for me for my second morning. On one evening I undertook the short walk to the piazza Cavour to the Palace’s sister hotel, the Barchetta Excelsior, to try the food at its Bistro. Here Chef Christian Babuin sends out into the modern, warmly decorated, ground floor room straightforward dishes of well-cooked food. The prosciutto with caramelised figs, tagliolini carbonara, fillet of beef with red wine sauce and mango and coconut parfait were all enjoyable. (These four courses were 56€.) Maitre d’ Andrea Rigamonti recommended a Chianti Classico Riserva of well-structured black fruit, which accompanied the beef very well indeed (Dievole, 2011 – 44€). My time in Como amidst its many delights was entirely worthwhile. 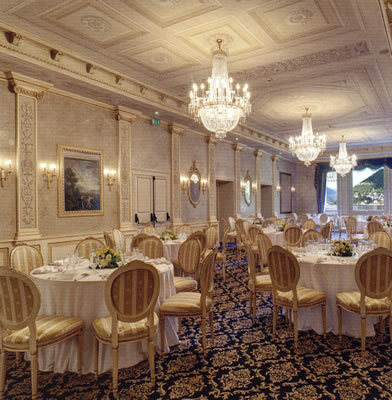 If you are thinking of making a visit, I can recommend the charming Palace Hotel. Lungo Lario Trieste 16, 22100 Como, Italy.